During the booking process you can choose whether to include tax as a lump sum on the final payment or proportionately on each payment. Each option is available whether calculating the tax on the final subtotal or against the retail price of the products and/or services. If tax is calculated against the final subtotal, the amount is a percentage of the final subtotal amount, regardless of the individual prices of the items in the order. If tax is calculated against the retail price of the products and services, the amount is a percentage of the retail prices you configured in your pricing, regardless of the final subtotal amount. 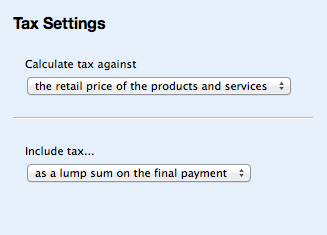 You can choose between two options for where you'd like to include taxes. You can choose to place it all on the last payment, or split proportionately across all payments.